This is my very slight adaptation of the now-famous No-Knead Bread recipe from Jim Lahey at New York City's Sullivan Street Bakery, published in November 2006 in the New York Times. While the basic recipe is very similar to the original (which is so simple that it would be hard to change), the variations are all ones that I worked out. Try one, try them all. In a large bowl, combine flour, yeast, and salt. Add water and stir until blended. Cover bowl with plastic wrap. Let dough rest at least 14 hours (or up to 20 hours) at warm room temperature. Dough is ready when its surface is dotted with bubbles; it will be wet and sticky. Throughly flour a work surface and place dough on it; sprinkle dough with more flour and fold it over on itself into quarters. Cover ball of dough loosely with plastic wrap and let rest 15 minutes. Using enough flour to keep dough from sticking to your work surface or to your fingers, shape dough into a ball. Generously coat work surface with flour; place dough, seam side down, on surface and dust dough with more flour. Cover with plastic wrap and then a towel and let rise for 2 to 2½ hours. When dough is ready it will be more than double in size and will not readily spring back when poked with a finger. At least a half-hour before dough is ready, heat oven to 450 degrees; put a 6- to 8-quart covered pot in the oven as it heats. When dough is ready, add dough to pot. Carefully, as pot will be hot, shake pan once or twice to more evenly distribute the dough; it will straighten out as it bakes. Cover with lid and bake 30 minutes, then remove lid and bake another 20 minutes, or until loaf is fully browned. Cool on a rack at least 20 minutes (preferably 30) before slicing. Variations: In Step 1, add either 1/4 cup chopped fresh rosemary; 1/2 cup roughly chopped pitted kalamata or other olives; 1/3 cup grated Parmesan and 1/2 tsp freshly ground pepper; 1 head of roasted garlic cloves (each chopped in half); or 1/4 cup oil-packed sun-dried tomatoes, drained well and finely chopped. 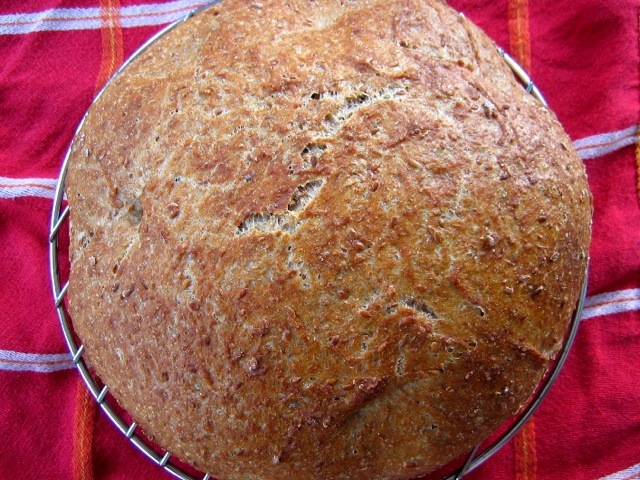 You can also make a rustic version of this bread by replacing one of the cups of bread flour with whole-wheat flour and adding 1/4 cup each of wheat bran and flaxseeds.